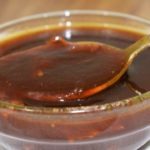 Tamarind Chutney is an easy to make delicious Indian sauce made using tamarind, jaggery and spices that can be served with Bhel Puri, Dahi Vada, Pani Puri, Dahi Puri, Aloo Chaat, Samaosa or any Chaat recipe of your choice. It is an integral part of any Indian Chaat recipe. Now a days, you do get those ready made packs of imli ki chutney. But, I have several reservations about these commercial products I never feel assured about the quality of ingredients that they use for preparing chutney. Secondly why not prepare a hygienic chutney at home which can be stored 4-5 month in freezer. Lets start preparing this tangy chutney. Soak the tamarind in a bowl with 2 cup of water overnight. The next morning transfer the soaked tamarind along with water to a pan and heat on moderate flame and bring it to boil.Once it starts boiling, switch the flame off. Pass the tamarind through a stainless steel strainer in the bowl. You need to continuously stir the pulp over strainer with pressure so that thick pulp gets properly strained and collect the tamarind pulp in the bottom. Discard the residue in the strainer. Remove seeds for dates and chop it into small pieces, also chop raisins into half of 1/4 size as per your choice. You can also leave raisins intact if you desire. Heat oil in a pan on medium flame. When oil is sufficiently hot lower the flame and add cumin seed and let them crackle. Then add garam masala powder, red chili powder and asafoetida. Stir and add strained tamarind pulp cook for 2-3 minutes on medium flame, then add sugar, grated jaggery, salt and rock salt to it. Cook again on medium flame stirring continuously till jaggery dissolves completely and the chutney starts boiling. When chutney starts boiling add chopped dates and raisins into it. Cook for 2-3 minutes more till chutney is of one string consistency. To check whether the chutney has reached 1 string consistency place a drop of chutney between your thumb and index finger and then move the fingers away from each other, you will see a formation of a string. This means the chutney is done. Remove pan from heat and keep it aside. 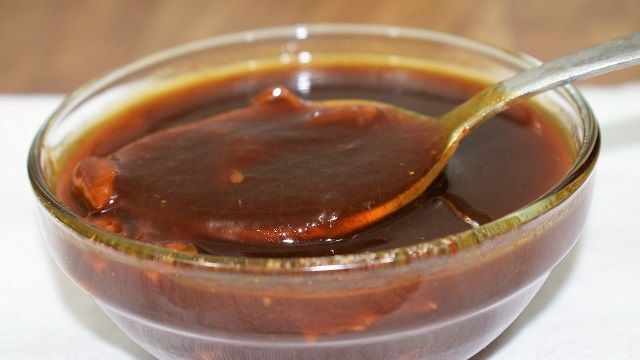 Your sweet and sour tamarind chutney is ready to use. Tamarind chutney lasts for more than a month when refrigerated. You can store tamarind chutney in air tight container in freezer for 5-6 months for later use. This Chutney thickens more on cooling so check for consistency before using. If the chutney get thicker - you cam mix required amount of water and boil the mixture for a minute or 2 go get desired consistency. You can serve sweet and sour tamarind chutney with Bhel Puri, Dahi Vada, Pani Puri, Dahi Puri, Aloo Chaat, Samaosa or any Chaat recipe of your choice.